Have you ever tried couscous? It's like pasta, but it's shaped into little beads. This was my first time using Israeli couscous which is also known as pearl couscous because the beads are larger than regular couscous. I've made couscous before - I just make the instant stuff right out of the box. 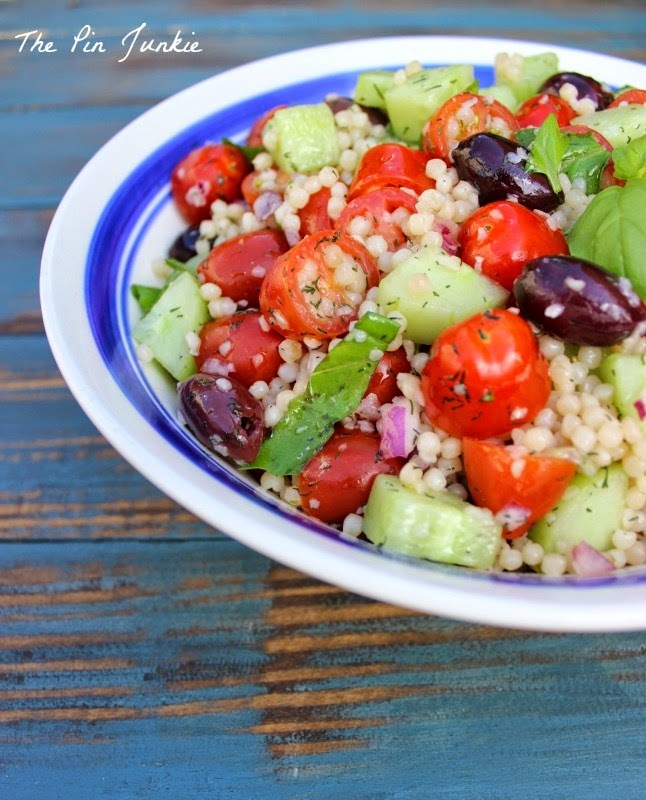 This Israeli couscous salad is so much better! It's packed with fresh flavors and with the tomatoes, cucumber, and basil it reminds me of a combination of tabbouleh and Greek salad. This is certainly a recipe than can be easily changed to suite your tastes by omitting or substituting ingredients. I changed the recipe by adding extra kalmata olives because I like them so much, I purposely left out the mozzarella cheese, and I realized later I completely forgot to include the artichoke hearts and chickpeas. Even though I didn't follow the recipe exactly, this Israeli couscous salad was a real hit at our house! I will definitely be making it again (and hopefully I can remember to include all the ingredients!) It's great on its own, but it would also make an excellent side dish and it would be perfect to take to a potluck. It's so easy to make too! The couscous cooks in about eight minutes. While it's cooking, just chop the vegetables and then mix everything together. I've been reading cookbooks and collecting recipes for years, but Pinterest is where I seem to find the best recipes! Be sure to check out my other Pinterest tried and tested recipes in my recipe index. Packed with fresh Mediterranean flavors, this versatile recipe can be easily adapted to suite your tastes by omitting or substituting ingredients such as feta cheese or artichoke hearts. For the vinaigrette, mix the ingredients in a bowl. Whisk together to combine. Set aside. Cook couscous in water according to the package directions. Set aside and allow to cool. Whisk the vinaigrette again and pour over the salad. Add fresh basil leaves and toss the salad to combine all ingredients. Add additional salt if needed. Can be served at room temperature or chilled. 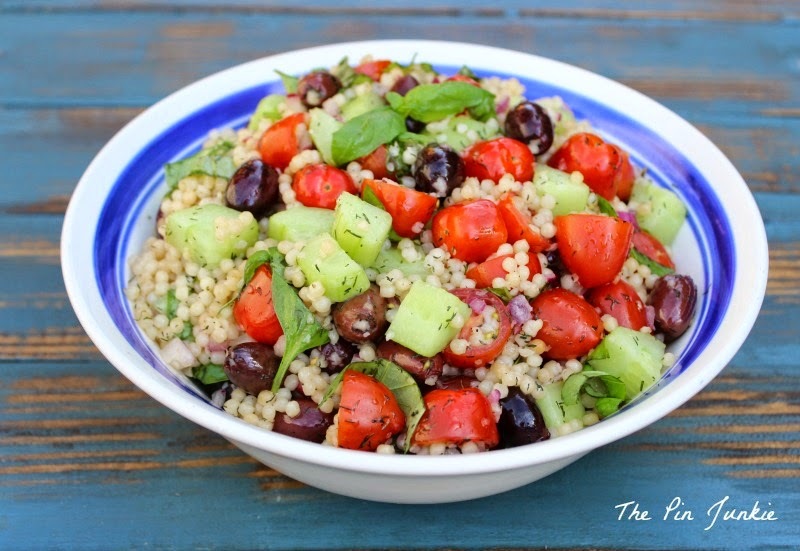 Inspired by this pin for Israeli couscous salad. Over from Too Cute Tuesday. Hey girl!!! Thanks for linking up to Creative K Kid's Tasty Tuesdays Linky Party. I've pinned your post to the Tasty Tuesday's Pinterest board!!! Have a great week!! Got to love this salad so healthy and fresh. Thank you for sharing!! This looks amazing, I really appreciate you sharing this. This is perfect for the summer! 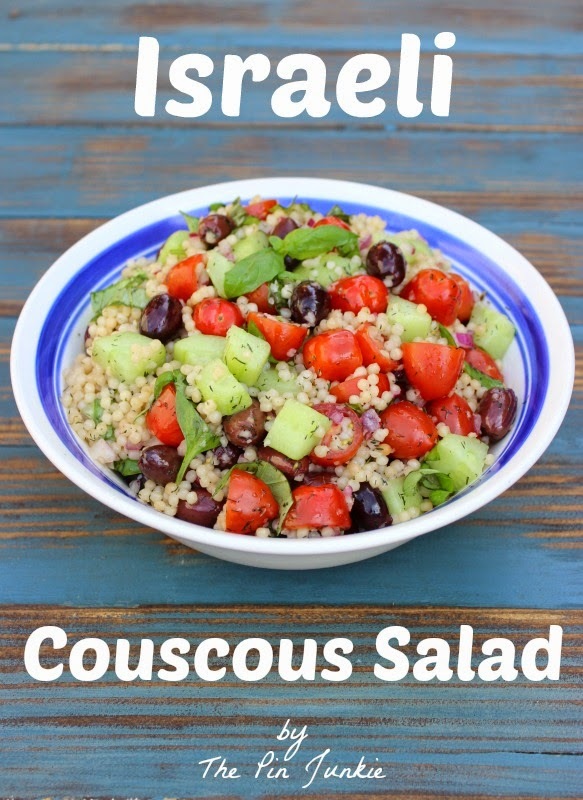 I cook couscous as a side dish now and then, but never thought of using it in a salad. Can't wait to try it! Thanks for sharing the recipe with SYC. This looks delicious- it would be the perfect lunch to bring to work! Your Israeli Couscous Salad looks and sounds delicious. I love finding a new and different recipe. Thank you for sharing with the Clever Chicks Blog Hop! I hope you’ll join us again next week! Looks good! Always looking for new ways to make couscous and this one looks really good! I LOVE couscous but I'm frequently at a loss for what to make it with. I never thought to use it in a salad. Visiting from the Wonderful Wednesday Blog Hop. This looks so good. It would be great for those upcoming summer cookouts. This looks so good! I'll be able to make this with the fresh tomatoes and cucumbers from my garden. This looks delish, with or without all the ingredients! I would love this, especially for lunch, all you have to do is dish it up, quick, perfect for me while working at home! THanks! This looks delicious, Bonnie! I usually serve couscous as a warm side dish, but I love the idea of serving it cold with Greek flavors. Pinning - thanks! Yummy ... this recipe looks so good! My family and I have spent a good amount of time in Israel and we love the Israeli food. We will have to try this recipe out some time ... by the way, I definitely like the Israeli couscous best ... it has the best flavor! Thanks for sharing. Hey girl!!! Thanks for linking up to Creative K Kid’s Tasty Tuesdays Linky Party. I’ve pinned your post to the Tasty Tuesday’s Pinterest board!!! Have a great week! !